1. 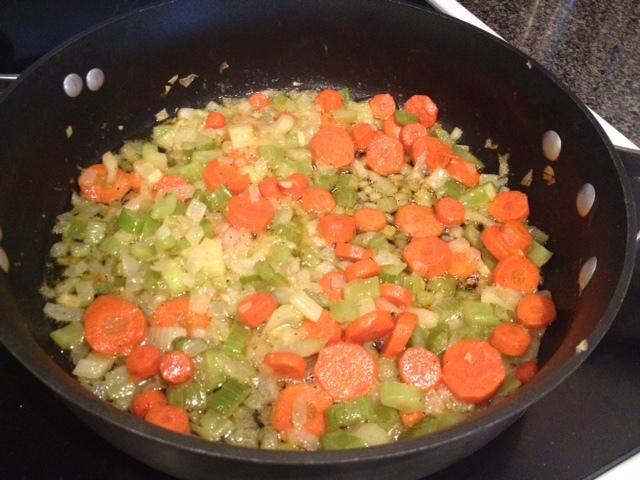 Chop 1 onion, 3 carrots, garlic, and celery and place in saute pan. 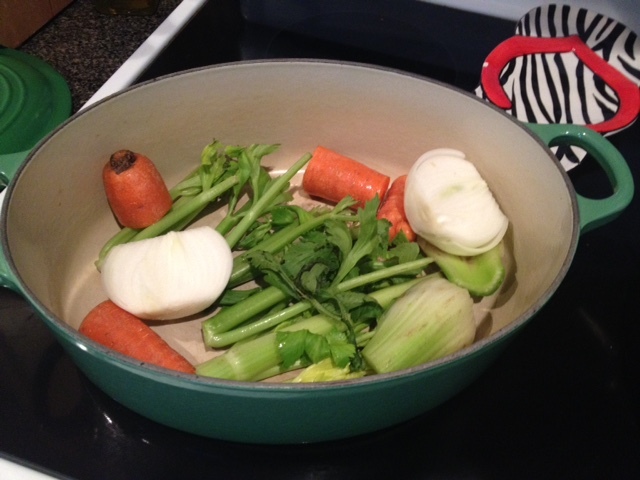 You’re going to reserve the celery leafy tops and bottoms, 1 carrot, and 1 onion sliced in half and place all of that in a pot to make your broth. 2. 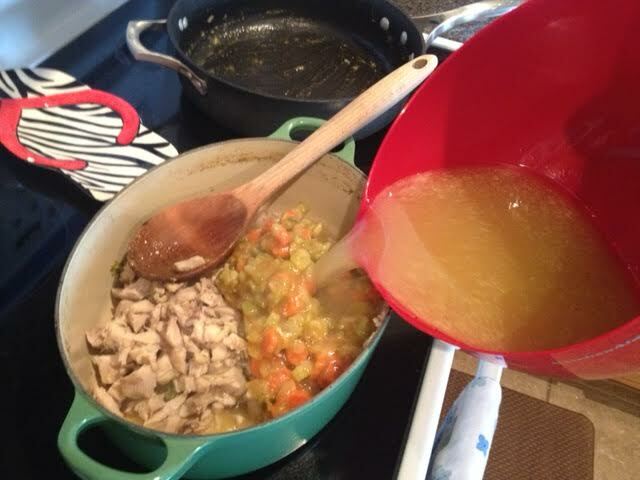 Add your marinated chicken to the pot with the veggies and add your chicken bouillon cube and enough water to completely cover the veggies and chicken. 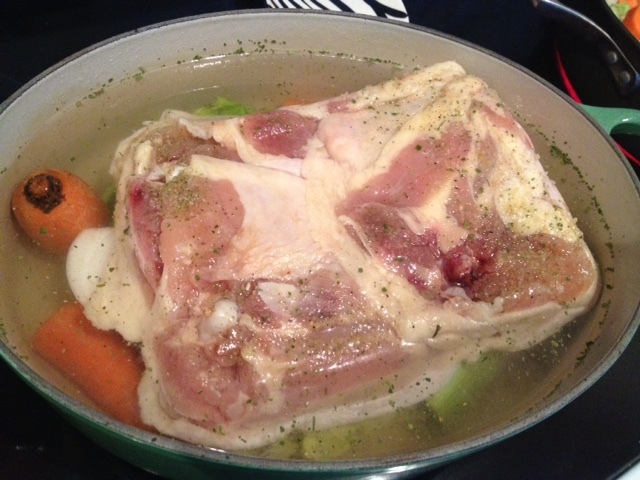 Set to a boil and let this go for about an hour. 3. 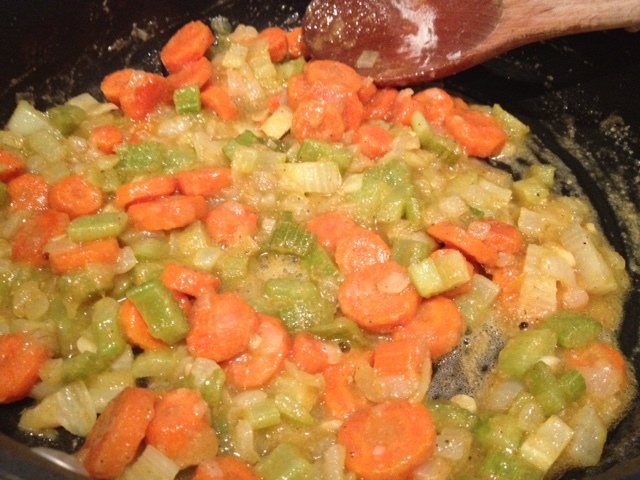 Meanwhile, add your butter, salt, and pepper to your veggies in your saute skillet and set that on about medium heat. 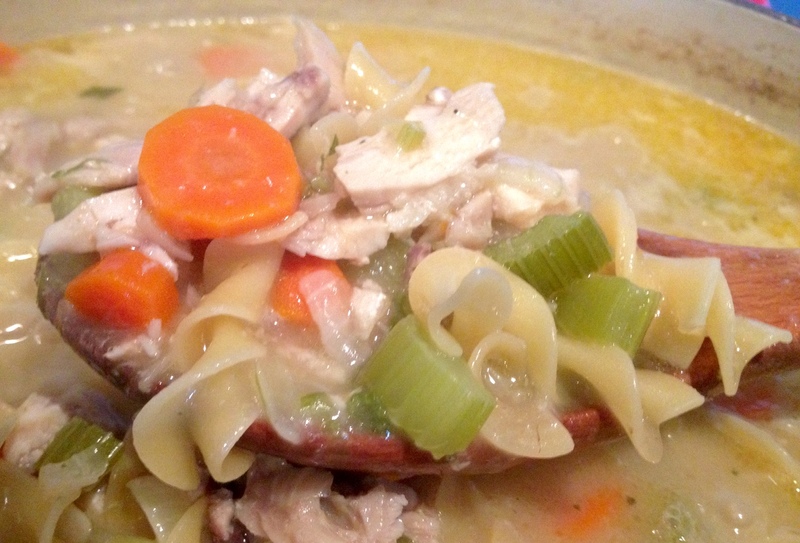 You don’t want to brown these – you want to sweat them out and cook until they’re soft and the onions are transparent. This should take about 20-25 minutes. You’ll notice in this picture there is only 1/2 stick of butter present. 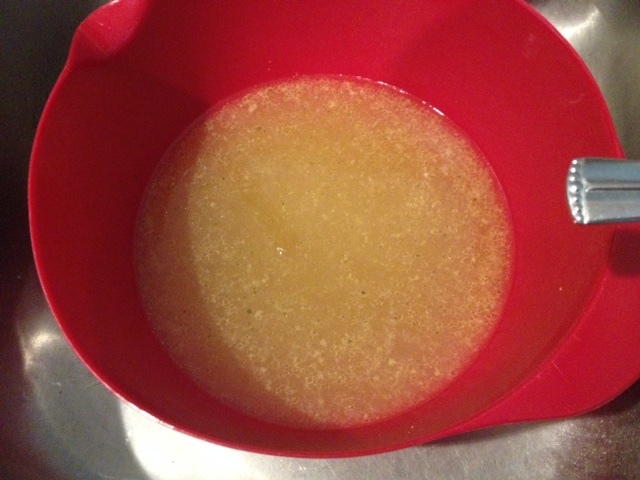 I decided halfway through cooking these they needed more butter. 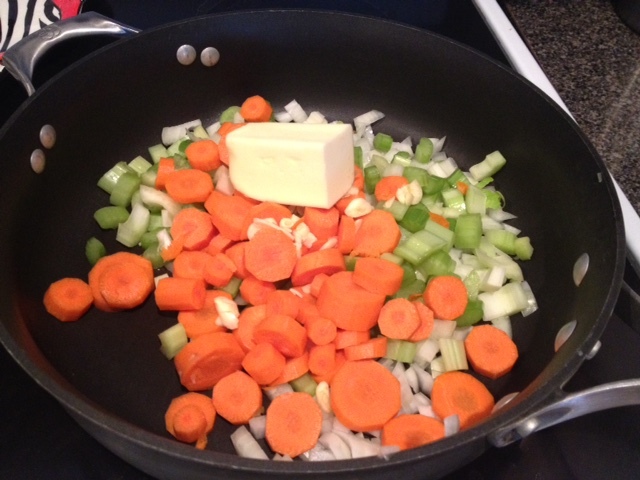 I think the lesson here is clear: When it doubt, add more butter! Amen. 4. 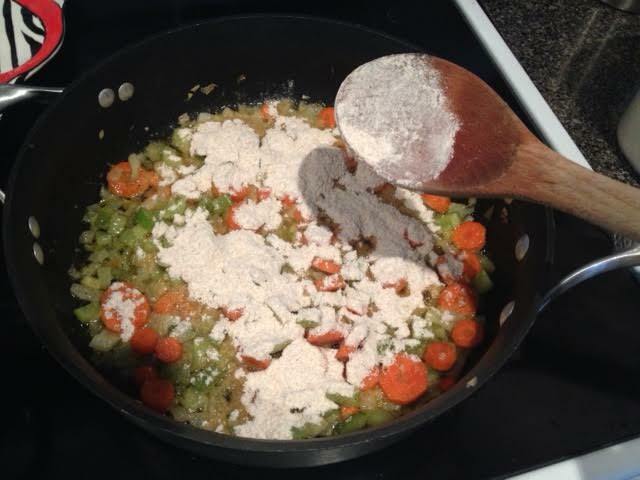 After your veggies are done cooking, add your flour and stir the veggies around for 3-4 minutes while the flour cooks through and it will thicken up the veggies. Then turn the heat off and set aside. 5. 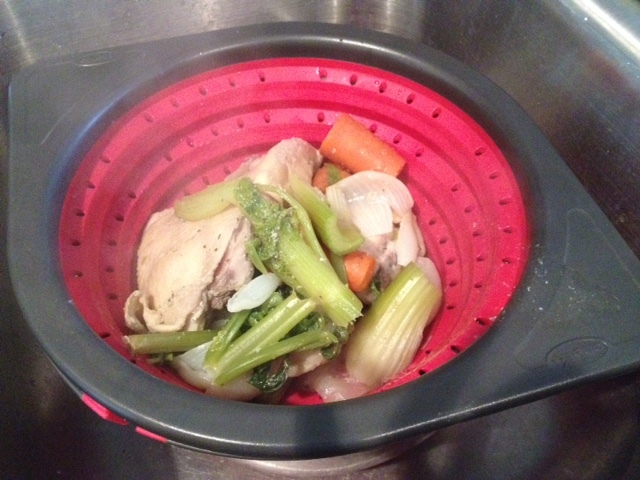 At this point your kitchen smells delicious! 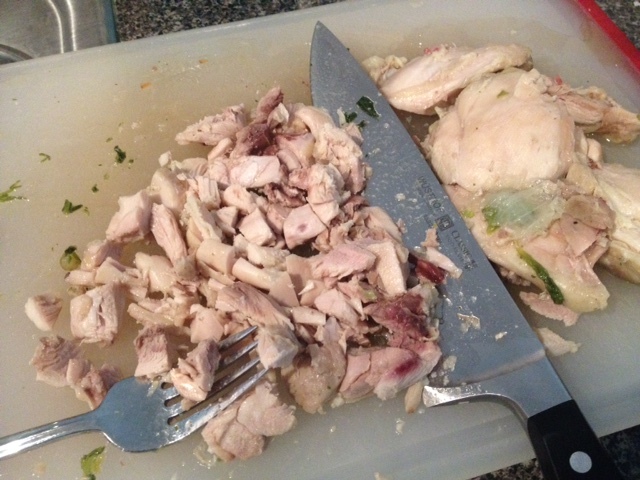 Don’t worry, you’re almost done… Now you’ll get out a strainer and dump your broth and chicken pot into it, allowing the broth to go into a bowl under the strainer and then pick out the chicken to cut into bite sized pieces on your cutting board (discard skin and bones). Rachel, sounds great. Good luck tomorrow. Love you dearly. It will be over before you know it.